The great thing about this recipe is you can cut it into large squares and serve it as a main dish or cut it into smaller squares and serve it as an appetizer. In a skillet, brown ground beef and drain. Add taco seasoning to the ground beef according to the package directions. Unroll crescent rolls into rectangles. Place in ungreased 11½ inch x 16½ inch jelly roll pan or cookie sheet. 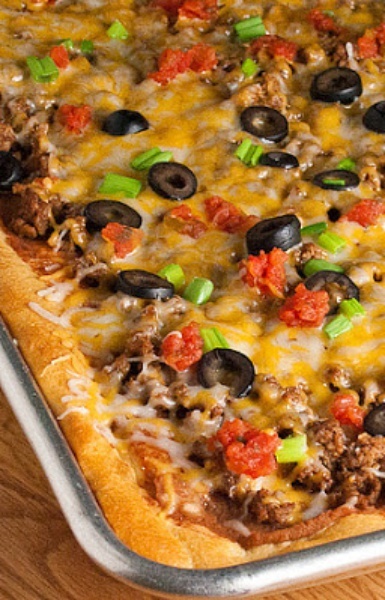 Press dough over the bottom and ½ inch up sides to form crust. Bake at 375 oven for 11 to 13 minutes or just until golden brown.